Grammarly makes money by selling premium plans starting at $11.66 to $29.95 per month. The company also makes money by selling human proofreading services to its paid users. Grammarly leverages on a freemium service, where free users are prompted to switch to a paid subscription. Let’s dig into the Grammarly business model and why it’s so effective. Grammarly vision is to build a comprehensive communication assistant. All Grammarlians care deeply about improving our users’ lives through better communication. We take personal responsibility for achieving aggressive goals both individually and collectively. Additionally, we all share a set of core EAGER values, which ensure that you are joining a highly effective, collaborative team. Therefore the mission is to improve our users’ lives through better communication. From these values, the objective is to offer a payoff of Grammarly users defined as to accelerate personal and professional growth. Advanced features, like grammar, context and sentence structure; vocabulary enhancement suggestions; genre-specific writing style checks and plagiarism checker detector are offered for the premium account which starts at $11.66 per month, up to $29.95 per month! Grammarly also offers a human proofreading service that allows paying users to get additional services, by choosing three modes of delivery (24 hours, 3 hours, 30 minutes). With its app for Mac, Grammarly makes it easy to use its editor to Apple users. With its app for Microsoft, Grammarly makes it easy to use its editor to PC users. The Grammarly Chrome extension is also a key tool that allowed the company to grow quickly its free users base. Thanks to a seamless UX and a set of prompts Grammarly managed to reach profitability and become cash flow positive. 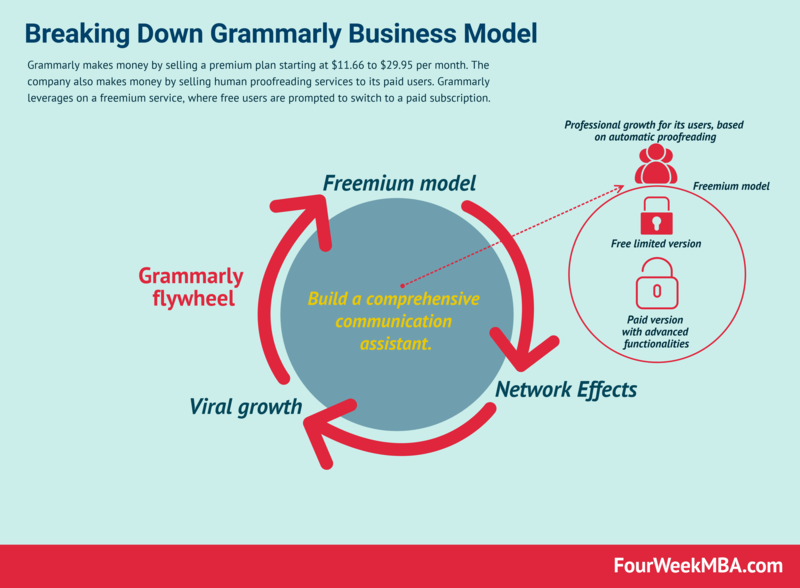 Grammarly leverages on a freemium business model. Its product is designed for virality as it offers a set of free tools, mostly compatibles with any device. Thanks to its AI and seamless experience, free users are turned in paying customers. Prompts within the product make it easy for free users to understand the benefits of having more advanced features through the paid version. Grammarly vision is to build a comprehensive communication assistant which payoff for its users is to grow professionally. Grammarly’s core values can be summarised in the “EAGER” framework. Grammarly is one of the best examples of how a freemium model, well engineered, can bring massive growth and virality for an organization. It is important to remark that a freemium model is not a size fits all. However, when you’re able to design a great product, a seamless experience, a simplified and gamified UX, and a clear payoff for paying customers, a freemium becomes a powerful weapon to grow your business!